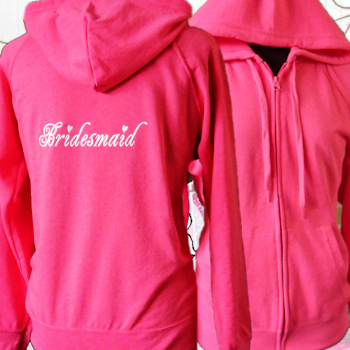 Hot Pink Personalised Zip Hoodie for the Bride to be, Bridal Party or Hen do. Hot Pink Personalised Zip Hoodie for the Bride to be, Bridal Party or Hen do. These personalised hoodies are embroidered rather than printed therefore are a lasting souvenir and gift from the celebration. A great alternative to bridal dressing gowns and a useful sweatshirt after the event. Hot Pink Personalised Zip Hoodie for the Bride to be, Bridal Party or Hen do. These personalised hoodies are embroidered rather than printed therefore are a lasting souvenir and gift from the celebration. A great alternative to bridal dressing gowns and a useful sweatshirt after the event. Ladies Lightweight unbrushed hoodie with raglan sleeves. Hood with self-coloured flat draw string and shaped side seams for a feminine fit. Two front pouch pockets, Waist and cuff in cotton/Lycra. Zip up front so you won't mess up your hair or make up! Warm machine wash. Do not bleach. Tumble dry. Personalised with an embroidered name or title of your choice across the upper back, just below the hood. Select the hoodie size you need and text thread colour for the wording. We embroider in Elegance font as shown. Please note: At Amys Gifts we do all our own embroidery work especially made to order and do our best to get all orders dispatched within approx 48 hours.